Yes, it’s true: You’ll soon be able to wash both your dainty delicates and a big pile of jeans at the same time, each with their own wash settings, thanks to a new mini-washing machine announced by LG today at CES. 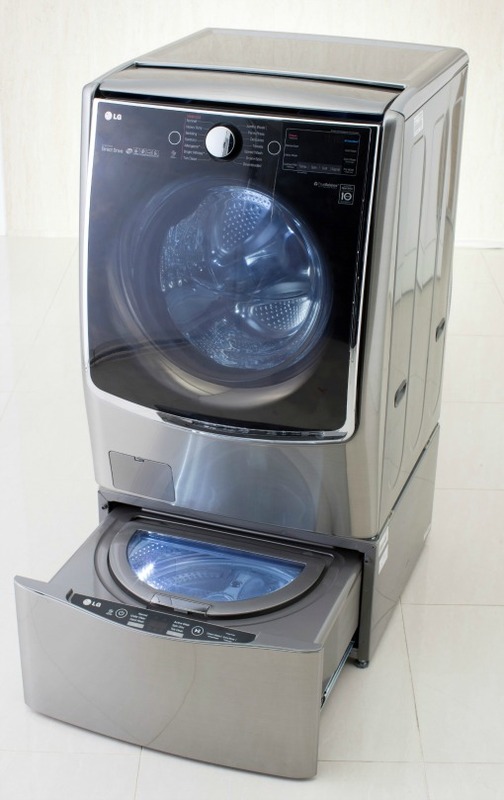 The WD100C/200C fits into the pedestal base of current LG front-load washers to form the Twin Wash System. This welcome innovation solves two of the biggest hassles in the laundry room: the accumulating stockpile of specialty items waiting until there are enough to run a load, and the extra time needed to run them. Let the mini-washer clear out the small batches while the main load runs. We’ll reserve final judgment until LG provides final information on the system’s price, availability and other details, but if the Twin Wash lives up to the promise, it will vastly streamline the chore of doing laundry. LG has introduced still more innovations this year to improve the laundry experience: faster washing with TurboWash, better drying with TurboSteam, greater economy with a heat pump eco-dryer and convenient Wi-Fi alerts to your phone when your laundry cycle is complete. Still, the Twin Wash concept could be the most significant leap in laundry technology in years — and that’s saying a lot for the venerable field of tighty-whities.